The term anemia means an insufficient supply of red blood cells and hemoglobin, the protein in red blood cells that transports oxygen to cells throughout the body. Anemia can develop when red cells and hemoglobin are lost through bleeding, when the body has trouble producing them, or when they are somehow destroyed. Because their cells aren't getting enough oxygen, people with anemia may feel fatigued, listless, dizzy and confused. In iron-deficiency anemia, the type of anemia most common in women, low iron levels are the problem. Iron plays a crucial role in the production of red blood cells and hemoglobin, so if it's not available in sufficient amounts, red cell production drops. There is a difference between iron deficiency and iron-deficiency anemia, says Craig S. Kitchens, M.D., professor of medicine at the University of Florida in Gainesville. It's possible to be iron-deficient without being anemic, he says. A woman who is iron-deficient has just enough iron to get by, while a woman who is anemic doesn't have enough iron to meet her body's needs, he says. Other, less common forms of the disease include anemia of chronic disease, in which anemia signals a serious condition such as liver disease, rheumatoid arthritis, inflammatory bowel disease or lupus, a chronic inflammatory disease that affects the skin, joints, kidneys, nervous system and mucous membranes; megaloblastic anemia, due to a deficiency of vitamin B12 or folic acid; pernicious anemia, in which there's difficulty absorbing vitamin B12; and aplastic anemia, in which the bone marrow has difficulty producing red blood cells. 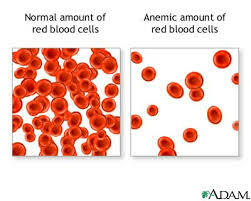 These types of anemia occur with about the same frequency in women and men.